Venerable Master Ching Kung (淨空法師; pinyin: jingkong fashi) (1927-) is an influential figure in Mahayana Buddhism. 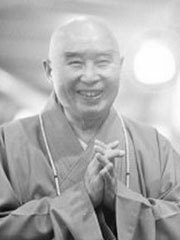 He is the founder of the Amitabha Buddhist Society, an association based on the teachings of Pure Land Buddhism, a popular school in many parts of Asia. He was born in Luchiang County, Anhui Province, China under the birth name of Yae Hong-hsu (徐业鸿). He entered the monastic life in 1959, where he was ordained at Lintzi Temple at Yuanshan in Taipei, Taiwan. It was then that he received the name of Ching Kung, meaning pure emptiness. Master Ching Kung is well known for using modern technology to spread the Buddha’s teachings. His lectures are recorded on audio, video tapes and CDs for wide distribution in many temples, including centers where people can pick up books to distribute to other places. He has sponsored the printing and the distribution of Buddhist texts worldwide, as well as portraits and pictures of various Buddhas and Bodhisattvas. All these items have been distributed free of charge. In recent years, Master Ching Kung has emphasized the Infinite Life Sutra and the Pure Land cultivation method of Buddha recitation, mainly the recitation of Amitabha Buddha’s name. Master Ching Kung is an influential figure in the Chinese Buddhist world. He is a master of the Pure Land School and a world-renowned Buddhist communicator. Master advocates returning to tradition in all aspects and maintaining a fairly cautious attitude towards emerging things. In his eyes, video games are really no doubt with the beasts. Ching Kung believes that killing in the game is no different from killing in reality. Those who see the game should be advised as much as possible, especially children, don’t let them play games. It hurts too much for physical and mental health. The people who make game consoles and games are even more guilty.